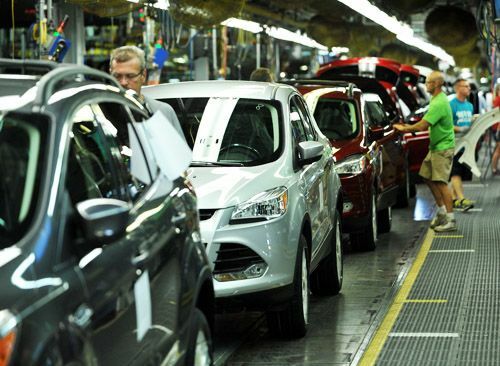 In the initial two quarters of 2013, Ford has sold more new Escape models than any SUV in its class, while the plant where it’s built has produced more new vehicles during the same period than any Ford plant in North America ever has. Ford says the new Escape is the first “small” utility to sell over 150,000 units in the first half of a year. Last year’s model set its own record selling 261,008 models during 2012. This year the new Escape is on track to break that record with 156,626 sold by the end of June. Offhand, the new Escape does not strike us as a small utility vehicle compared to its named competitors, namely the Toyota RAV4 and Honda CR-V. If it were built in Texas it might explain the designation but the plant that builds the utility is in Louisville KY. So it must be comparison to the Explorer and Expedition that makes the Escape a small utility. Does that make the Explorer a midsize SUV? We digress. That plant in Kentucky has added a third shift to keep up with demand and that’s where it counts – exactly where it’s needed, right? Keeping more American workers employed, that is. With a sales uptick of 23 percent over last year, Escape is far ahead of the segment, which has shown only 13 percent growth overall. However, the real news is on the coasts, where the SUV has nearly tripled the performance of the competition with sales up 33 percent, where brand converts are contributing greatly to the model’s success. Just look at these numbers: up 61 percent in Miami, 41 percent in Orlando, 33 percent in Charlotte and Seattle, Washington DC sales are up 31 percent, San Francisco 26 percent, along with 25 percent in Boston and Los Angeles. In New York and San Francisco the Escape is wooing former Honda owners while in the other municipalities, Toyota owners are crossing over to the Ford. This is significant because across numerous years, Honda and Toyota have dominated coastal sales. It looks like Ford has hit a homer with the all-new Escape.